If you’re a writer on Pinterest, chances are you’ve come across some of the countless writing prompts floating around. Now, I love prompts. 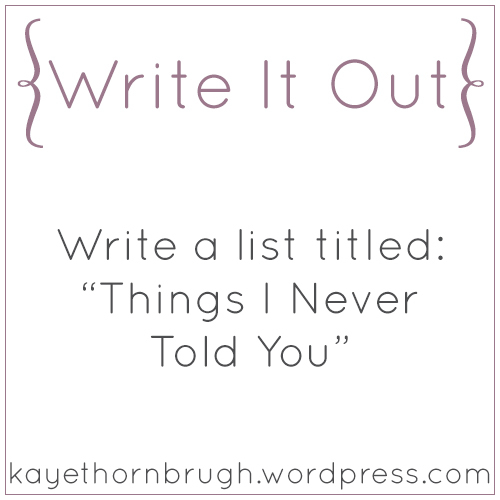 I hoard them, actually, and use them as writing exercises—inspiration for vignettes or flash fiction that give me a short break from my regular writing and help me stretch those creative muscles. Which brings us to Write It Out. Most of the prompts will be pretty straightforward, but every now and then, I’ll mix things up with an Alternate Universe Prompt. This is basically what it sounds like: I’ll post an alternate-universe (or “AU”) scenario, and you’ll drop your characters into it. (Like, say, reimagine all your characters as pirates.) These AUs are really more for fun than the regular prompts, so I hope you’ll have a good time with them. Hopefully, these prompts will spark some ideas for you. If you write something cool based on a Write It Out prompt and share it online, please shoot me the link. I’d love to see what you come up with! Okay, you know what to do: It’s time to write it out!